Suppose that there had been no 2009 Great Recession in the euro zone. In that case, the unemployment rate now would be no higher than the 7 percent of 2008, instead of the current 12 percent; GDP would have increased to around 8 percent higher than now; and the fourth quarter’s 0.3 percent GDP growth would be acceptable. After all, a 1.2 percent annualised GDP growth rate is probably just about high enough to keep up with technological improvements in a region that is already rich with an ageing population. Better still, the pace of euro zone growth is increasing. The previous quarter’s increase was only 0.1 percent and analysts only expected 0.2 percent in the most recent period. That suggests that the GDP growth rate will soon rise to 1.5-2 percent, fast enough to improve Europeans’ global economic standing in the hypothetical world without any recession scars. In the real world, the preliminary GDP estimate represents more mixed news. On the good side, the euro zone seems finally to have entered a virtuous circle of growth. Germany, which had 0.4 percent GDP growth in the fourth quarter, is clearly on the right track, although its unemployment rate is already a comfortingly low 5.1 percent. For the region’s laggards, the positive GDP numbers, including the first quarterly increase in Italy since mid-2011, provide hope for more jobs and naturally falling government deficits. With more jobs and less austerity, GDP should then increase faster. On the bad side, the improvements could easily be derailed by a new panic in financial markets, political problems within or between the members, or even a sharp reduction in emerging economies’ demand for European exports. Even if nothing bad happens – indeed, even if the GDP growth rate increases a bit – unemployment will fall only slowly and government debts will hardly fall at all. It would be nice to erase history, and it would be splendid if more euro zone members could emulate the German record of job creation. As it stands, though, inadequate growth is about the best that the euro zone can produce. 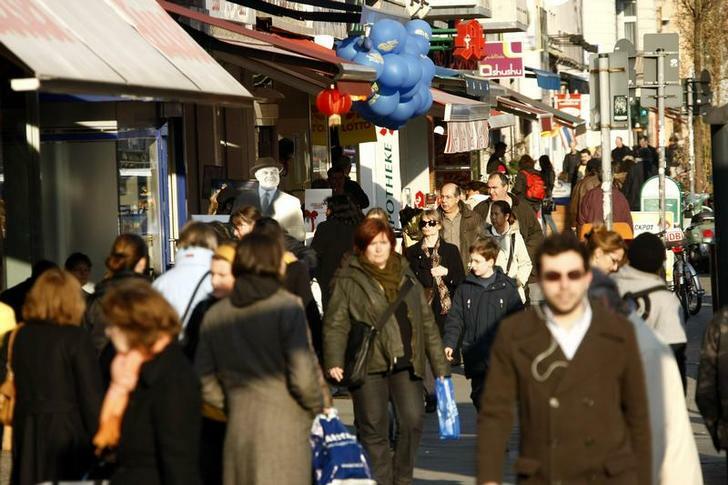 Euro zone GDP grew more than expected in the last quarter of 2013 thanks to stronger expansion in its biggest countries, France and Germany, the first estimate from the European Union’s Statistics Office showed on Feb. 14. In the three months to December, GDP was 0.3 percent higher than in the previous quarter. The third-quarter increase in GDP was 0.1 percent. Analysts polled by Reuters expected a 0.2 percent quarterly rise. Compared with the same period of last year, euro zone gross domestic product rose 0.5 percent, above market expectations of a 0.4 percent rise. The first estimate does not provide a detailed breakdown into GDP components, which will only be available on March 5.